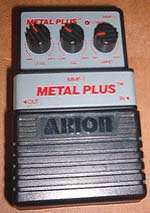 Looking to buy the Arion Metal Plus MMP-1? Check for availability. simple distortion pedal, with only three controls: level, eq (which goes from low to high), and grind (aka distortion). thought this might be good as the metal master...no. it's a standard distortion that really cant hold its own in a loop. dont waste your time...get the metal master. Bad Points: ...but rare, so sometimes not as cheap as it should be. © 2001 - 2019 GearBug.com. All rights reserved.